Once the holiday vortex is behind us (even as we’re in the full swing of Carnival), there are times when you need to switch gears, get out of town and get a change of scenery. It is moments like these when getting in a car and taking a short jaunt out of town is just the ticket to re-charging your family’s collective battery. Deep in Acadiana, in Breaux Bridge, there’s Lake Martin, which is part of the Mississippi Flood plain and one of many swamps with tours. What makes Lake Martin different, however, is its smaller size and shallow water. What this means for you (and specifically the small children in your life) is that instead of zooming across the water in a loud air boat, you coast along in a flat-bottom boat while a guide shows you plants and wildlife. 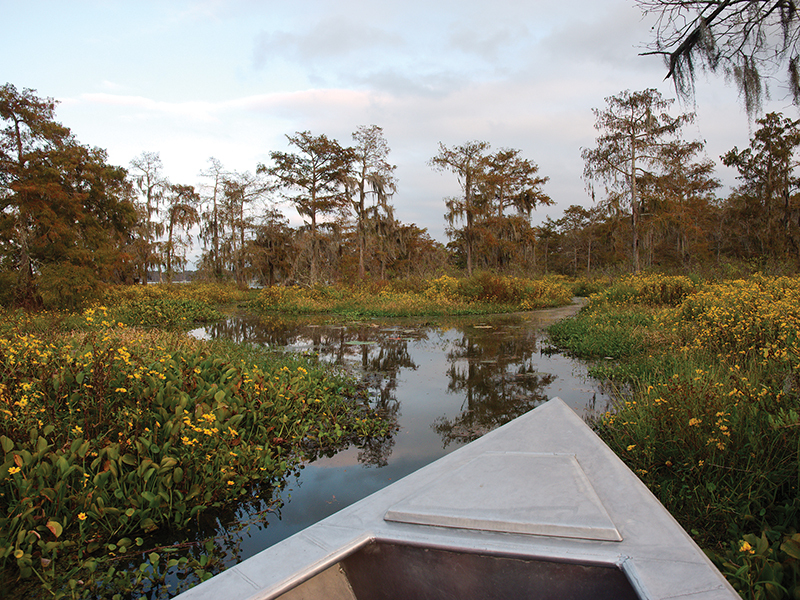 Champagne’s Cajun Swamp Tours is one company that offers just this type of visit, and it’s a different experience than your average swamp tour. While such a visit seems like a spring or summer event, the cooler (but not cold) temperatures are often a good time to visit the area, which is not only a home for several alligators but also several bird species, including the snow egret and blue heron, whose spectacular plumage are almost as impressive as the gators that peek their heads above water. The tour guides are extremely knowledgeable about the area and dedicated to educating visitors about its conservation. There are also walking trails, but they’re closed when alligators are nesting. Although you need a reservation for most of the swamp tours, in the low season they can be made as late as the day before or even the morning of your trip, if it’s a spur-of-the moment decision. Once you’re in and around Breaux Bridge, it’s worth exploring the downtown as well as checking out a few of the local eateries that serve Cajun and Creole dishes like mom used to make (without mom having to cook). Glenda’s Creole Kitchen is an old-school establishment with a menu that changes daily, but has everything from your basic meatloaf and spaghetti and meatballs, to smothered just about everything – not to mention her famous stuffed turkey wings. Her cakes are also not to be missed. Again, the menu changes daily, so if you have a gang of picky eaters it’s worth calling ahead to see what’s on the daily rotation. Down the road a bit is also Poche’s, which has a similar – although a bit larger – menu, as well as a meat market if you need boudin or cracklings for the ride home. A little farther up the road, in Arnaudville, is a place that doesn’t, at first glance, seem like the most child-friendly option, but Bayou Teche Brewery, aside from serving a bunch of tasty beers, also has some great sodas, root beer and a large outdoor area with a giant Connect-4 game where you can sit, sip and chat about all you’ve seen that day. There is often live music in the weekend afternoons and the entire space is welcoming with friendly, knowledgeable staff. The brewery offers tours as well, but, as always, it’s best to call ahead to reserve. While most parents can never imagine taking a road trip during February or spend most of the Carnival season planning to do just that, a short trip out of town is a sure – and relatively easy – way to give everyone a quick break from the routine of life that can be both mundane and crazy during the Carnival season. Hours: Mondays-Sundays, 10 a.m.-2 p.m. Hours: Mondays-Sundays, 5:30 a.m.-8 p.m.